Dwight McNeil was an ocean of calm in a occasion fraught with the nerves of a Premier League relegation six-pointer, while a number of controversial incidents raised the temperature of the game. McNeil, at 19, has gone from boy to man in the space of 15 games over the second half of the season, coinciding with Burnley’s remarkable run of form, which has seen them garner 27 points, to move from the cliff edge to safety. The wide man has been a major factor in that turnaround, registering statistics that have marked him out as the best performing teenager in the top flight. Boss Sean Dyche praised his composure as he helped carve out both Burnley goals for Chris Wood, the second of which, late on, finally killed off Cardiff. 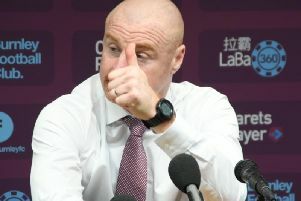 Dyche said: “He’s a really good player, he’s improving, his calmness at the end - I’m saying get it in the corner - but he cuts in, and his calmness to cross it into a dangerous area, and then gets his reward. McNeil is one of the major pluses to come out of what has been a long and testing season, producing a level of consistency almost unheard of from a talent so young. He has given a string of right backs - several internationals among them - uncomfortable afternoons, with the way he glides across the pitch, finding that extra yard to deliver devastating crosses when seemingly there isn’t space. And he has also chipped in with his fair share of goals as well. Double his statistics over the full campaign, and he would be up there with more vaunted talents such as Jaden Sancho at Borussia Dortmund. Without getting carried away, Burnley could conceivably have saved upwards of £20m in the current market with his emergence - maybe much more. But unless there is an offer that the club simply cannot refuse, surely he is better off playing regular Premier League football in the meantime? Burnley’s left hand side gives great hope that such a testing season could be avoided in future, with Charlie Taylor also having grown in stature over the campaign. If anything, he probably just about edged McNeil as man of the match against Cardiff, in a game which should have been over at half-time. Wood headed against the post from Ben Mee’s flick on from an early McNeil free kick, before Ashley Westwood again caused chaos with a corner. McNeil fired over the angle from a clever Jeff Hendrick pullback, and as the one-way traffic continued, Westwood fires straight at Neil Etheridge from Wood’s throughball. A breakthrough looked inevitable, and when McNeil whipped over a corner, Wood’s movement gave him the freedom to head in. Westwood again couldn’t take a golden one on one opportunity, this time from an Ashley Barnes pass, and Hendrick arrowed a shot beyond the far post. Burnley could conceivably have gone in four or five to the good. But while it remained 1-0, Cardiff still had hope, and they pushed hard after the break. It looked like they had won a penalty when Mee headed a Joe Bennett cross against his own hand, but the officials overruled the spot kick, coming to the correct decision - Mee neither did it deliberately or was seeking to gain an advantage. Junior Hoilett then scooped over Cardiff’s only real chance of note from Kenneth Zohore’s centre, and Burnley began to regain a measure of control. Mee has a header clawed away by Etheridge from a McNeil corner, before the youngster tied Aron Gunnarsson in knots and fed over a cross which, deflected up towards the far post, was nodded in by Wood, to earn a much deserved win, and effectively ensure Premier League survival with four games to spare.